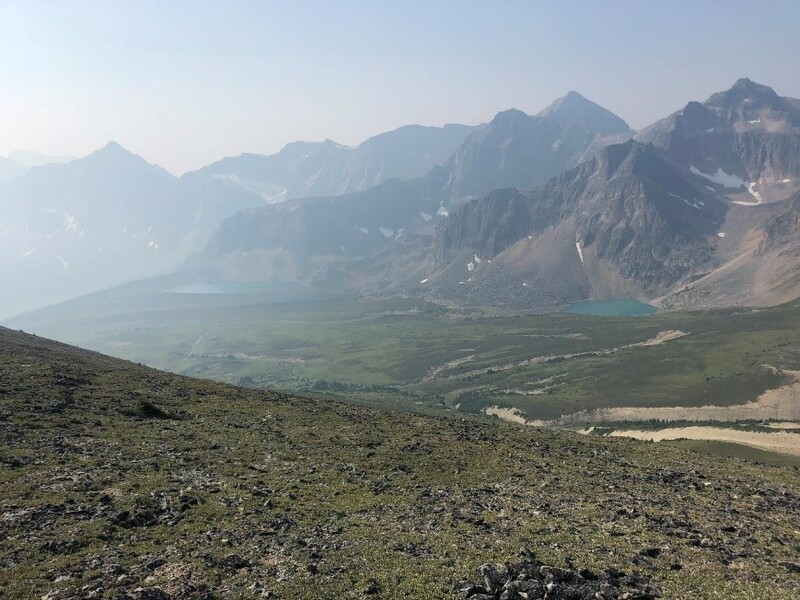 Having volunteered with the GDTA for the past few years, it was definitely time to walk a section of the Great Divide Trail this summer. 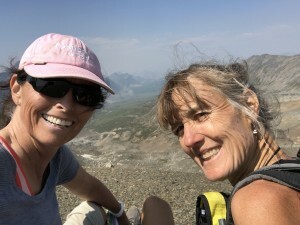 My hiking partner was the formidable Lynnie Wonfor who some of you may have met on a maintenance trip. So you get a sense of our abilities, we affectionately describe ourselves as two middle aged moms who love hiking and are up for an adventure! Inspired by the updated Guidebook by Dustin Lynx and feeling well supported by the GDT App by Atlas Guides or Guthook, we chose Section E – Saskatchewan River Crossing to Jasper northbound, which according to the guidebook “is a joy for anyone who likes trekking above timberline.” And that it was!! We had an absolutely amazing time! I won’t bore you with all of the details but do want to encourage anyone thinking of hiking Section E to consider hiking the Six Passes Alternate Route. It was a high point of our trip for us. 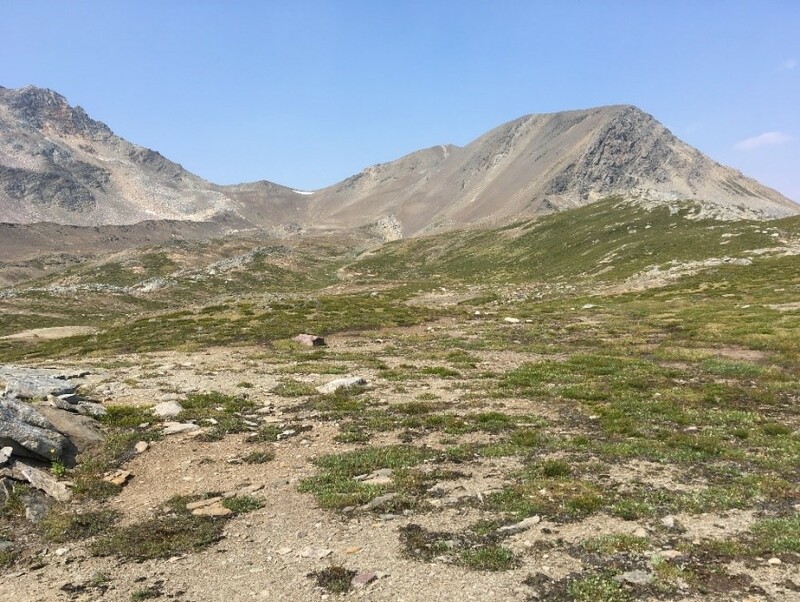 It’s far more remote than other parts of section E; there is no trail, no route markings, no cairns. We saw no people and definitely followed more animal tracks than footprints. The remoteness and the feeling (rightly or wrong) that not many had hiked this area made it special for us. 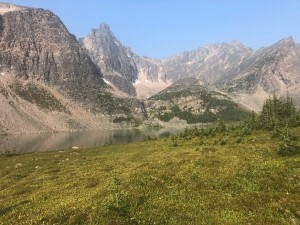 Throughout the first few days of our trip, we did research on the alternate route – we asked everyone we met who was thru hiking whether they had done the decommissioned trail along Maligne Lake or were considering doing the Six Passes Alternate Route… not one person had done the Six Passes Alternate Route and the thru hikers going northbound were going to have a look but didn’t sound too convinced to me. 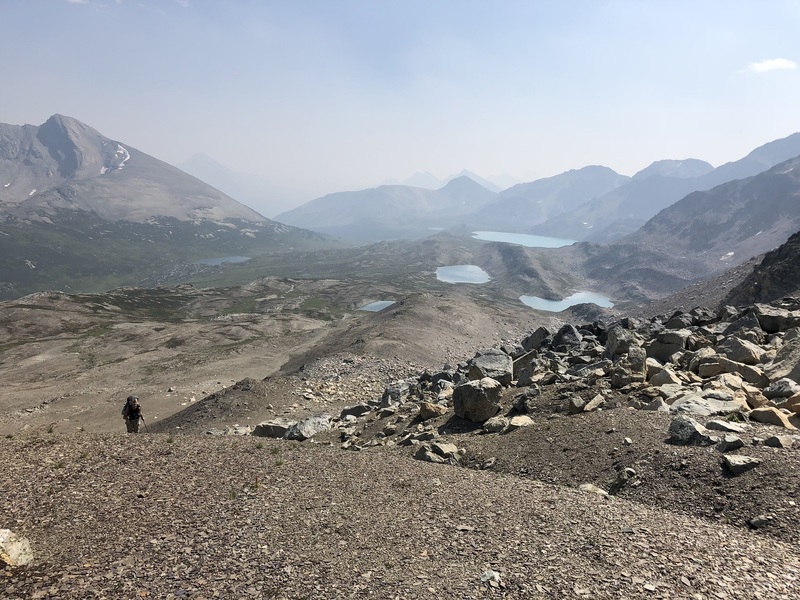 And those that had hiked the Maligne Lake trail, didn’t really have any good things to say about it. Spurred on by this feedback and the GDT Guidebook, “This is one of my favourite hikes of the entire GDT, a real gem.”, we thought we had no choice, we had to give it a go. 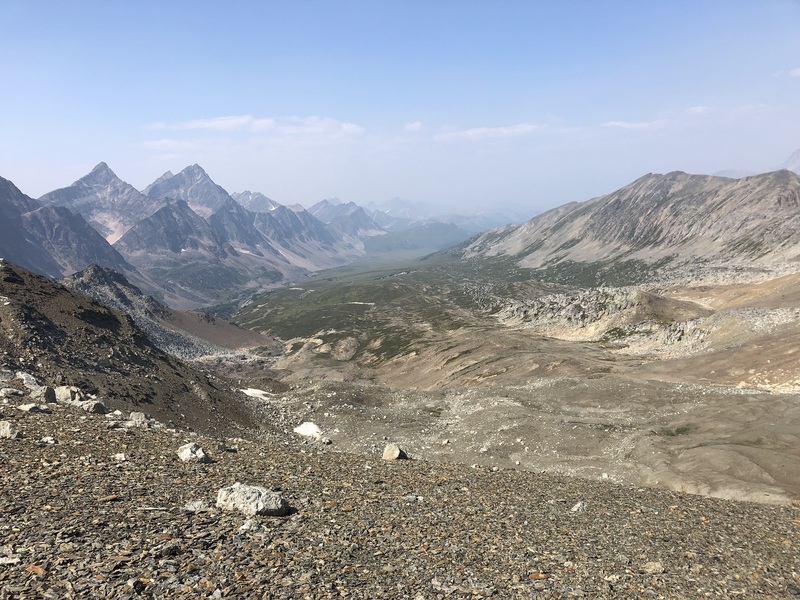 So on our sixth day, we made our way up to Maligne Pass from Poboktan campsite and at the pass looked hard to line up the six passes, which according to the Guidebook is critical. Well for the life of us, we couldn’t see the six passes. 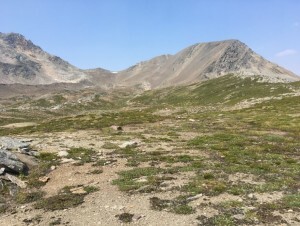 We saw only one pass and were hoping that the trail went to the right towards a grassy slope. It didn’t. So we made our way up the scree-like pass, got good traction on the incline and got to the top of the pass without any problem. 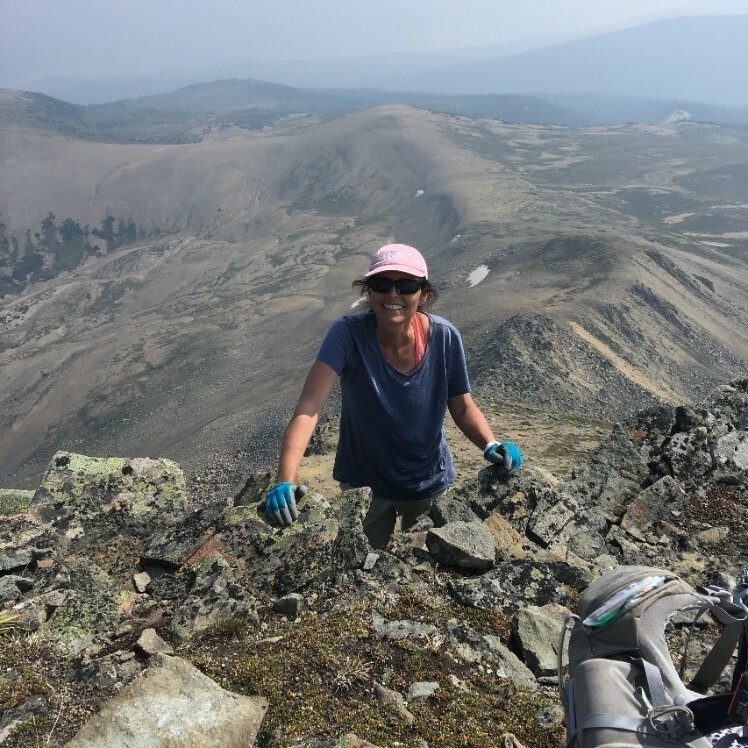 This first pass was a high point of the trip for us… we felt a great sense of excitement and adventure and the views from the top were spectacular. We were on our way onto the alternate route. We spent the next two days walking the alternate route, going up and down the six passes. We’d point our phones with the GDT App to get the general direction, pick something to walk towards and then check again in a bit. For some this is sacrosanct – we didn’t rely on a map and compass but used GPS. At the end of the day, wouldn’t have been able to hike the alternate route without the App. I have a poor sense of direction. So we are both very grateful to River Taig and everyone at the GDTA who worked on the App, it opened up a section of the wilderness to us and for that we say THANK YOU! Here are few more pictures from the hike up to the sixth pass and along the ridge to meet up with the Bald Hills trail. This section of the route is particularly spectacular! Some are a bit hazy due to smoke from forest fires. 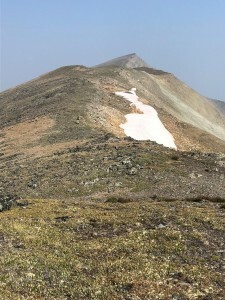 The down scramble from the peak after the sixth pass is not that bad. We went to the summit and then peeked over to find a reasonable place to go down. We headed down the spot that had a few ledges, which made it feel like there wasn’t any exposure. The place to be really careful is just after this scramble. The rocks are deceptively loose, it is really easy to innocently set off a few rocks towards your hiking partner. For those going onto the Skyline, the shortcut mentioned in the Guidebook is still accessible. If going southbound, the trail is sign posted from the Skyline to Bald Hills and if going northbound, we’re not exactly sure where the trail starts from the Bald Hills trail, we went a bit early into the trees afraid that we might miss it. I don’t think you can miss it, it’s a double tracked huge trail at the south end. 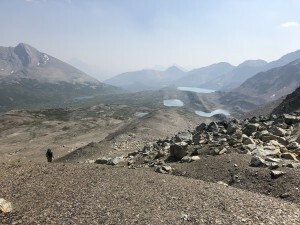 I think that the most significant challenge with hiking the alternate route (that is in addition to going up and down more than 2,000m) is random camping. There are lots of flat places with access to water but limited places to hang a bear bag. The trees just aren’t tall enough. We camped just before going up the second pass and between the fifth and six passes. The first night we couldn’t find anything tall enough to tie our food to, which is a problem. The second night, there were big boulders that worked well for us. However, our bear hang did get visited by small rodents in the night, as the string had been played with. Luckily, mighty Lynnie did a fantastic job tying the food up and the little guys were unable to get it down. 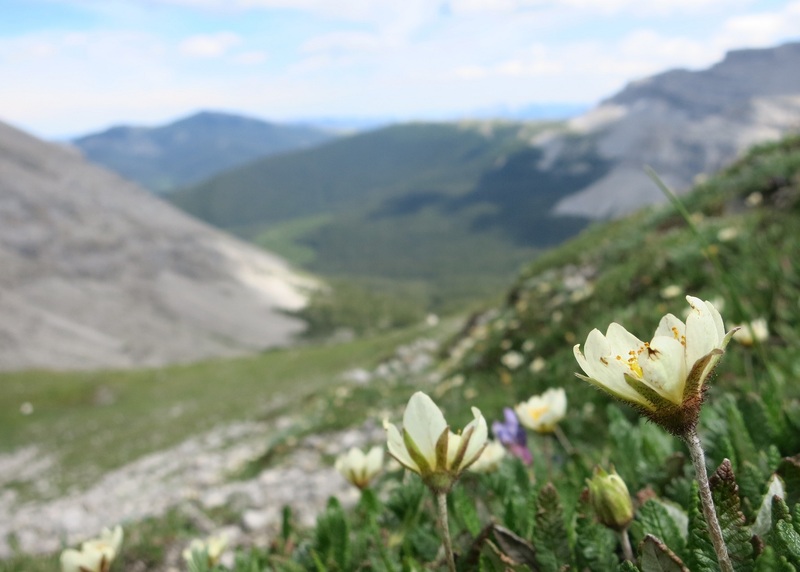 You will need a random camping permit from Jasper National Park to camp in the area. Note that they won’t issue you one during times that are sensitive to caribou, i.e. during the calving and rutting seasons. 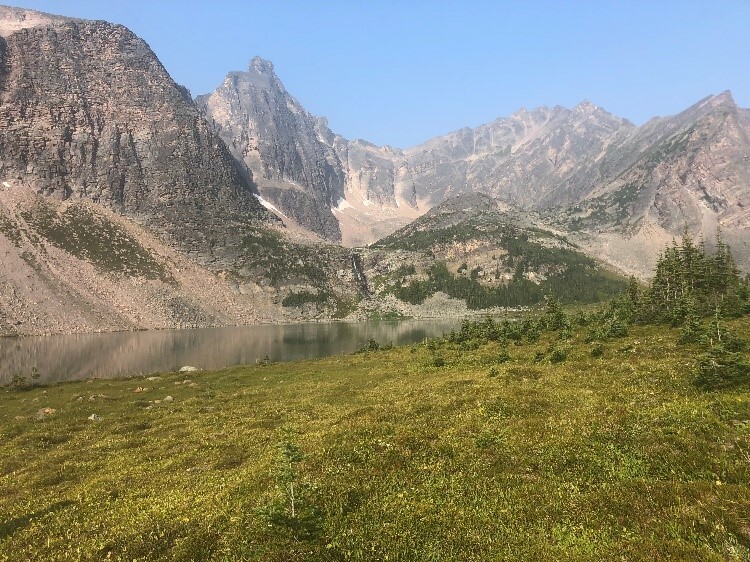 Overall, we would definitely recommend hiking the Six Passes Alternate Route over the decommissioned Maligne Pass Trail.